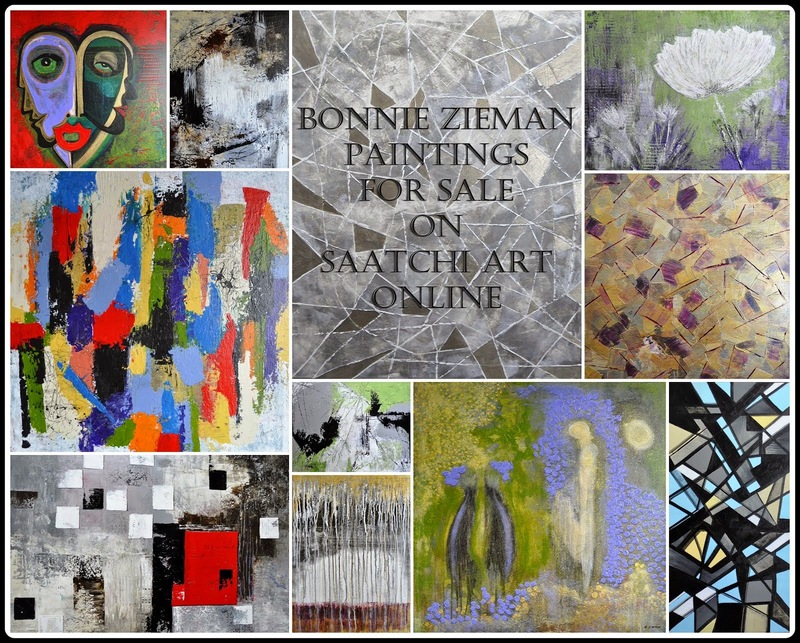 Original Art Studio: Once in a blue moon! Could this be a sign of good things to come? We will have a New Year's Eve this year that we see only 'once in a blue moon'!! This will be the second full moon in December, 2009 and it will happen on the 31st. It is called a 'blue moon' when there is more than one full moon in a given month. I have posted a little article from NASA below, giving more details about these rare 'blue moons'. Now don't expect the moon to actually be the color blue. It will just be full, miraculous and shining down on YOU! Have a safe New Year's Eve and a healthy, happy new year. And do enjoy this 'once in a blue moon' event! New Year's Eve Party planners take note. For the first time in almost twenty years, there’s going to be a Blue Moon on New Year’s Eve. "Most months have only one full Moon. The 29.5-day cadence of the lunar cycle matches up almost perfectly with the 28- to 31-day length of calendar months. Indeed, the word "month" comes from "Moon." Occasionally, however, the one-to-one correspondence breaks down when two full Moons squeeze into a single month. Dec. 2009 is such a month. The first full Moon appeared on Dec. 2nd; the second, a "Blue Moon," will come on Dec. 31st. This definition of Blue Moon is relatively new. If you told a person in Shakespeare's day that something happens "once in a Blue Moon" they would attach no astronomical meaning to the statement. Blue moon simply meant rare or absurd, like making a date for the Twelfth of Never. "But meaning is a slippery substance," says Hiscock. "The phrase 'Blue Moon' has been around for more than 400 years, and during that time its meaning has shifted." The modern definition sprang up in the 1940s. In those days, the Farmer's Almanac of Maine offered a definition of Blue Moon so convoluted that even professional astronomers struggled to understand it. It involved factors such as the ecclesiastical dates of Easter and Lent, and the timing of seasons according to the dynamical mean sun. Aiming to explain blue moons to the layman, Sky & Telescope published an article in 1946 entitled "Once in a Blue Moon." The author James Hugh Pruett cited the 1937 Maine almanac and opined that the "second [full moon] in a month, so I interpret it, is called Blue Moon." Blue moon has other connotations, too. In music, it's often a symbol of melancholy. According to one Elvis tune, it means "without a love of my own." On the bright side, he croons in another song, a simple kiss can turn a Blue Moon pure gold. 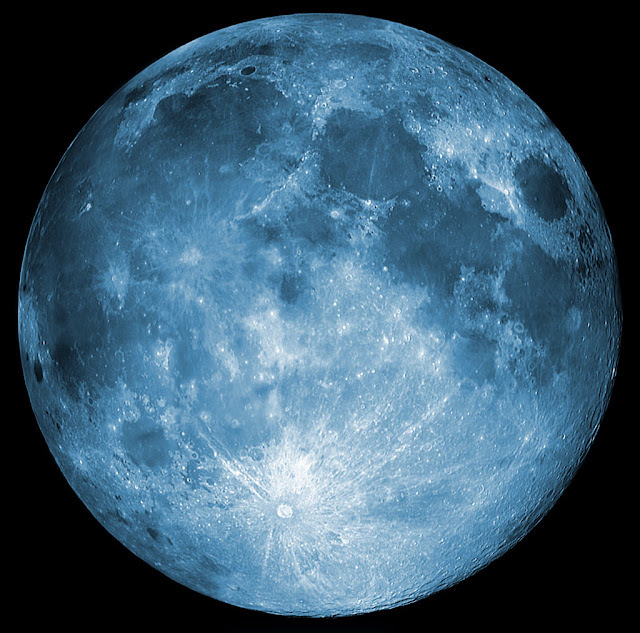 The modern astronomical Blue Moon occurs in some month every 2.5 years, on average. A Blue Moon falling precisely on Dec. 31st, however, is much more unusual. The last time it happened was in 1990, and the next time won't be until 2028. So cue up that old Elvis record and "enjoy the extra moonlight on New Year's Eve," says Hiscock. "It only happens once in a Blue Moon." Oh, I'm so glad you explained this. I heard there was some atronomical thing happening, but wasn't sure what it meant. 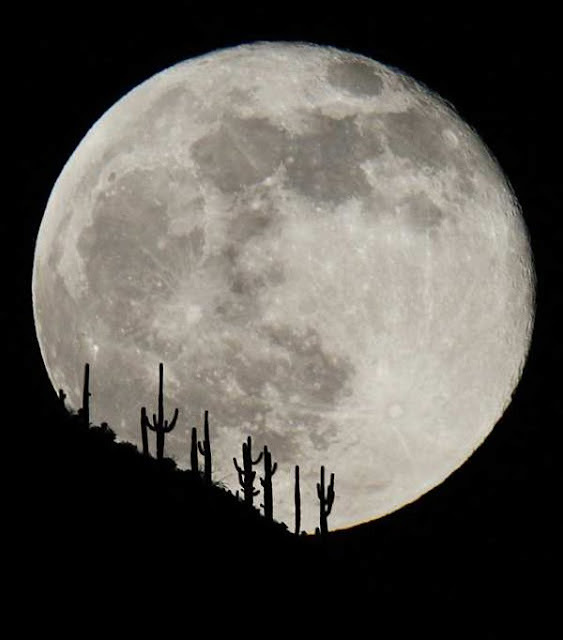 Love full moons and the picture with the desert is so amazing. Just drove across the southwest for Christmas and saw such beauty. Glad to be home. Happy new year to you, Bonnie! Hope 2010 is wonderful for you and yours. I always wondered what a blue moon was, ever since I heard the song as a kid. Now I know! Thanks for sharing that. You have a very interesting blog. the snow effect is very cool and peaceful. Gotta go, I want to see more of your posts. I was going to write a very similar post, but you've beaten me to it, and done a most splendid job, too. For what it's worth, it will also be a day of very extreme tides both high and low here in Northern California, at least, as the earth, moon, and sun are closer together than usual. I'm planning to go out to the coast tomorrow morning to have a look at these unusually high tides. If there is ablure moon here in Melbourne tonight two hours from midnight we cannot see it for the clouds, rain and lightening. But we're not complaining. The temperature rose near enough to 40 degrees C today so that we relish the cool change. Sadly the weather has mucked up the firworks, but there are worse things in life. Happy new year, Bonnie. Enjoy it under your blue moon. It's overcast and foggy here this morning. It is supposed to clear up later though. A full moon on New Year's Eve has to be full of good portent. We will certainly feel blue here in Toronto, Bonnie, because it is so cloudy we have no hope of seeing the Moon, blue or otherwise! So there goes another rare astronomical event. Have a Happy New Year and all the best for 2010! Have a Happy New Year, Bonnie, thanks for the information on the Blue Moon! I've been anxiously awaiting it!